Since graduating from the degree program where I officially earned my title of "expressive arts therapist," I have had several potential future ETs ask me about the field, wondering if this is the right career path for them. This is often a difficult and exciting conversation to have! In answering them, I reflect on my own path as an artist, educator, and therapist. I also tell whoever I am speaking with that expressive arts therapists are all different - we all bring something different to the work and we all do the work in different ways, in different places, and with different people. My path and my work is not going to look the same as that of another expressive therapist. 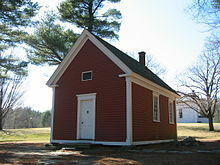 I came to the work with the training and education of a performer and teacher. This background shapes my work as an ET and, in many ways, defines it. Another part of my career development is the path I took down the road of early childhood education. In my story, I often mention that being an early childhood educator was never in my plans, but has become as defining to my identity as an expressive therapist as my background in performing arts. 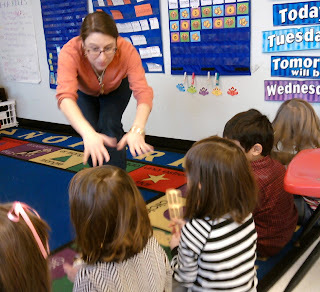 Me conducting a "rumble" with pre-k students in a music instrument circle. Today, I have a better sense of who I am as a person, an artist, a teacher, and expressive therapist. Over time, I have developed specialized areas of the work I do; early childhood, autism spectrum disorders, and learning disabilities. I continue to hone my craft as a therapist, educator, and as a (my first love) - performer! For me, being an expressive arts therapist is the greatest job in the world. I can share my love of performance and the arts while affecting lives - including my own. When I show up to run a story dance group with preschoolers who have speech delays, who have experienced trauma, who struggle with motor skills, and witness a little one light-up and smile when they dance with a scarf, jump to the tambourine, or dance to the music, I know I have made change in the world. It may seem like a such a small thing, but it is so huge, it is bigger than me. Being a part of that, there is nothing more fulfilling. There is nothing more affirming. That is not to say the road is an easy one, the struggles have been many. As I often say to those who are interested in joining the field, we create our own jobs. This can mean going out on your own - marketing, promoting, traveling, renting space, and all that fun stuff. It can also mean taking a job in another position and bringing expressive therapies to it. When I talk about it, I feel empowered to be a part of this community of people who are still evolving the field. It can also be frustrating and depressing at times, especially when your paycheck may not reflect the value of the work you do. Despite all the obstacles that one may face discovering themselves as an expressive arts therapist in a field that is still getting to know and define itself, I could not imagine living any other way. If you have passion for the arts and making change in the world, this may be the path for you too. 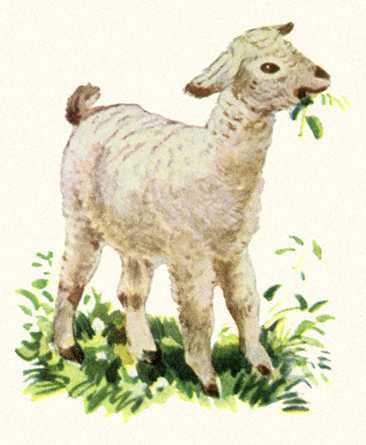 During the month of March, I introduced the lamb (who grows up to be a sheep) for the toddler and preschool story dance classes. 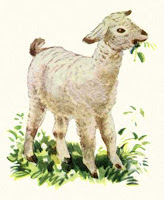 Using a book with great illustrations, I read Mary Had a Little Lamb (we also sang). The lamb grows-up to be a sheep and we read Little Bo Peep, then we sang and read Baa Baa Black Sheep. We also changed the color of the sheep a few times. After reading Mary Had a Little Lamb, we played follow-the-leader. I gave one tot the stuffed animal and she became the leader and we all followed her around the room. We played this until everyone got a turn. I followed the leader while tapping a beat on the tambourine. The stuffed animal as a turn-taking prompt has been working very well for the toddlers and preschoolers. And since sharing is not a toddler's greatest skill, I am so glad when I see them hug and pass. We also acted out Little Bo peep, which the little ones really seemed to get a kick out of. I pretended to be Little Bo Peep, distraught over losing all my sheep, while the children hide (pretended to hide). Then, they all come back wagging their tales behind them. They wanted to play this several times, some children took turns as Bo Peep. Toddlers and preschoolers enjoyed the dramatic action! In general, props have a wonderful role in the creative movement class, and other expressive arts, as they invite imagination, extension, and discovery of movement; a theme I have seen repeated over and over. Visual and kinetic learners may especially appreciate when a prop appears in the learning space.